Vinyl that always makes the cut. 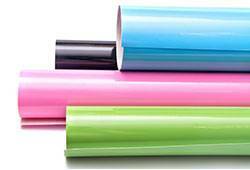 Get a range of different sized and textured vinyl for use with our vinyl cutters and heat presses. Reliable Vinyl is vital for creating top quality prints on caps, t-shirt, mugs and more using our range of innovative sublimation equipment. Get clean, precise vinyl pressing using PixMax vinyl, available in a range of classic primary colours, as well as intriguing selections like gloss, glitter and super opaque block out vinyl. Each sheet is self-adhesive, so they are mega easy to apply and simple to arrange for consistent results, whatever the size of your design. Our vinyl selection isn’t just suitable for garment pressing, it can also be used for vehicle graphics, wall coverings, wheelie bin coverings, exhibition signs, house numbers, car decals, bikes, boats, window coverings and sign making - so start personalising your world today.